The 2019 Community Ecumenical Service for Good Friday, based on the Seven Last Words of Christ, will take place on Friday, April 19, 2019, from 12 noon to 3pm at the Guilford Community Church, United Church of Christ. 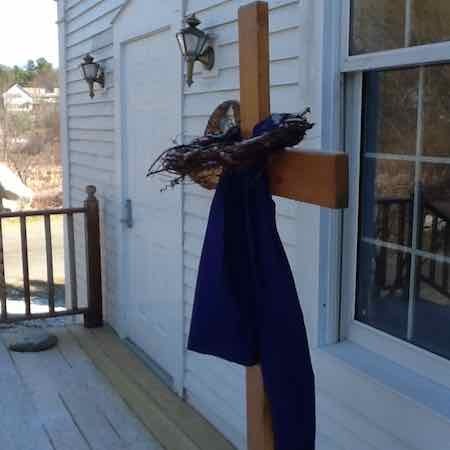 Thirteen pastors and church leaders from churches around the greater Brattleboro area and a Choir of the Community, under the direction of Peter Amidon, will come together to reflect on the story of Christ’s Passion. Beginning at noon and at twenty-five minute intervals, the public is invited stay fo the entire time or to come as they can and leave as they must. Each portion includes a hymn, anthem, contemporary reading or prayer, a portion of the crucifixion story and a reflection by a local pastor. The first section begins at 12 noon with Rev. Suzanne Andrews, pastor of the First Baptist Church, offering the first meditation on Luke 23:13-34, “Father, Forgive Them; For They Know Not What They Do.” The second section will begin at 12:25 with the Rev. Dr. Scott Couper, Pastor of the Centre Congregational Church, U.C.C, reflecting on Matthew 27:38-44 and Luke 23:39-43, “Today You Will Be with Me in Paradise”. The third section begins at 12:50 with the Rev. Dr. Lise Sparrow, pastor of the Guilford Community Church, UCC, meditating on John 19:19-27 “Woman, behold thy son…Behold thy mother!”. The fourth begins at 1:20 with Rev. Audrey Walker, pastor of the First Congregational Church, UCC, offering a homily on Matthew 27:45-49, “My God, my God, why hast thou forsaken me?”. The fifth begins at 1:45 with Pastor Emeritus, Rev. Dr. Larrimore Crockett’s reflections on John 19:28-29, “I thirst”. At 2:10 the Rev Susie Webster-Toleno, pastor of the Westminster West Congregational Church, U.C.C., will continue with reflections on John 19:30, “It is finished” and the final section will begin at 2:35, closing with Luke 23:44-46, “Father, into thy hands I commit my spirit!” as interpreted by the Rev. Shayna Appel, of the All Souls Unitarian Universalist Church. Music for the day includes traditional hymns along with the following anthems taken from diverse musical traditions: “All In the Morning”, “Kedron ”and “Morning”, all traditional shape note; “Ukuthula”; from South Africa, “Camina, Pueblo de Dios”, Spanish; “There Is a Balm in Gilead” and “I Will Arise”, both African American spirituals and “Ubi Caritas” by Maurice Duruflé. Choir rehearsals are scheduled for Monday April 15 from 7:30 to 9 and on the day of the service beginning at 10:30.The choir is open to everyone. Guilford Community Church, U.C.C. is located at 38 Church Drive in Guilford, one mile south of exit 1 on route 5, just past the Guilford Country Store. For more information call Rev. Sparrow at 257-2776.